1925: The year Paris became the center of fashion and style. It also launched the Art Deco movement, still seen today in architecture, and a variety of beautiful antique engagement rings that even Daisy Buchanan would envy. Prohibition, speakeasies, the Charleston, the Art Deco movement-the 1920s were a whirlwind of growth and change in the United States, and around the world. They're not called the "roaring '20s" for nothing! Women's hairstyles got shorter, and so did their skirts. Coco Chanel, Clara Bow, and Greta Garbo set the trends, and women across the globe followed them, abandoning their corsets and tight bodices for free-flowing fashions that flashed a little leg. The Art Deco influence permeated everything from clothes, to architecture, to jewelry. Its distinct features are still easily recognizable today, despite the movement only lasting 15 years, until 1940. The Art Deco movement took its name from the Exposition Internationale des Arts Décoratifs et Industriels Modernes (International Exposition of Modern Industrial and Decorative Arts), which took place in Paris in 1925. The goal for Paris was to emerge from its recovery after World War I as the most fashionable of cities, and the center of taste and luxury, a reputation the city maintains to this day. The Paris Exhibition revealed the shapes and patterns that became the hallmarks of Art Deco style-geometric shapes, hard edges, ziggurats, and chevrons. The look is unmistakable in the architecture of buildings such as Rockefeller Center and the Chrysler Building in New York City, and in the jewelry crafted during that period. Art Deco jewelry is noted for its use of platinum and white gold, and vivid colors added by gemstones cut into geometric shapes. It was during this time that the diamond shapes baguette, trapeze, triangle, and half-moon gained popularity. 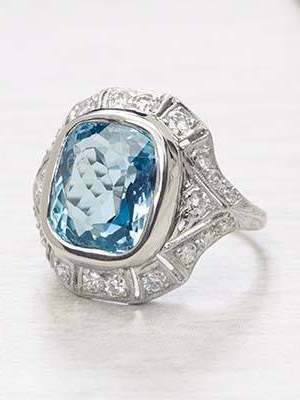 Despite the use of colored gemstones in necklaces, bracelets, brooches, and cocktail rings (which grew in popularity in the '20s), Art Deco engagement rings continued the trend started in the Edwardian era-platinum or white gold settings, with diamond center stones and accents. Some engagement rings did use colored gemstones-emeralds, rubies, and sapphires were popular-as accents, but the focus was on diamonds. Art Deco engagement rings also incorporated the hard lines and geometric shapes of the period, with square settings and criss-cross patterns. This was more easily accomplished by the advent of machine cutting for gemstones. Up to this point, gemstones had been handcut, which resulted in fewer facets, and less sparkle. Many historical periods are brought to life through books, and the '20s is no exception. If one book defines the decade, it's The Great Gatsby by F. Scott Fitzgerald. The book has staying power, but it's perhaps the handful of film adaptations that have brought it to life for many fans, even to the point of inspiring Gatsby-themed weddings. The glamour and shine of the dress, the opulence, and yes, the jewelry, have inspired many brides to plan ceremonies as fanciful as the '20s themselves. And it all starts with the flair of an Art Deco engagement ring. Shop our extensive collection of gorgeous antique engagement rings to find your perfect fit.